It is quite literally the city that never sleeps for residents of Westminster in the East Village. Tenants filed complaints over noisy air conditioner and refrigerator units that cool the 7-11 convenience store on Avenue A. They told CBS 2 that they haven’t been able to rest at night since the store opened last year. “For too many months, Westminster’s concerns about 7-11’s noisy units fell on deaf ears. We completely agree with local residents – the units installed and owned by 7-11 need to be moved, and we’re working to make sure it happens,” a spokesman for Westminster management said. The store has received violations from the city along with a cease and desist order, but still residents toss and turn. “We’ve had to move out of our bedrooms on the third floor, as well as the first floor, in order to be free of the noise,” another tenant added. In a statement, 7-11 said that it has been working with the landlord of the property to resolve the issue. The landlord was scheduled to appear at a hearing of the environmental control board to present a plan for relocating the refrigeration units. The landlord did not have a comment on Monday night. Categories: 7-Eleven on Avenue A, Fighting Chain Stores | Tags: 7-Eleven 170 Avenue A, Westminster Management | Permalink. Last week, we had an update on 7-Eleven and Westminster Management’s illegally placed AC and refrigeration units at the newish Avenue A 7-Eleven which, so far, have racked up $17K+ in fines. Today, we hear first hand from tenants who live in these buildings how the plethora of units outside their windows impact their lives, for example, like not being able to sleep in their bedrooms. 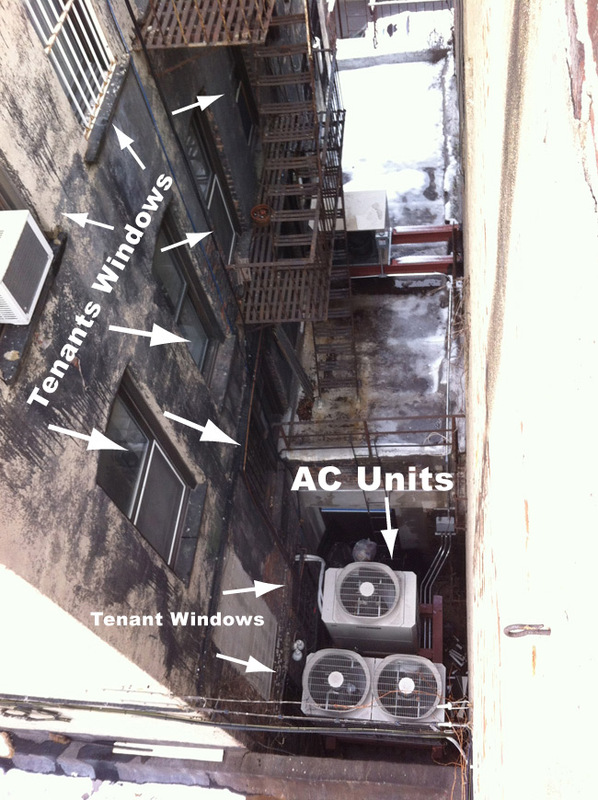 Three illegally placed AC units clutter the small alley between 500 and 502 East 11th St. The large, industrial units block the first floor side window of 502 East 11th St and, when active, create a constant hum, banging and vibration (let alone blocking any light that made its way to the first floor window) and establish an unlivable environment for the first floor tenant (of which there is only one). The illegal refrigeration unit is placed on the one story roof between 500 and 502 East 11th St. immediately outside of the bedrooms of four separate, second floor apartments (two in each building). This unit significantly violates the noise pollution laws (twice cited by the DEP). The noise and vibrations that this unit emits have resulted in tenants in 502 East 11th St. to abandon their bedrooms and re-position their entire family in the living room. The noise is constantly grinding, clicking, and vibrating making it unbearable for ALL the tenants on all the floors between the two buildings — one of whom is a freelance film editor who is now unable to work at home. ALL tenants are suffering in one form or another. Dozens of calls have been placed to 311. The Department of Environmental Protection has come to take noise measurements two times, each time resulting in a significant violation. Both 7-Eleven and Westminster refuse to relocate the refrigeration unit to either the basement (where it belongs) or to the roof of 500 East 11th St. (a viable alternative). 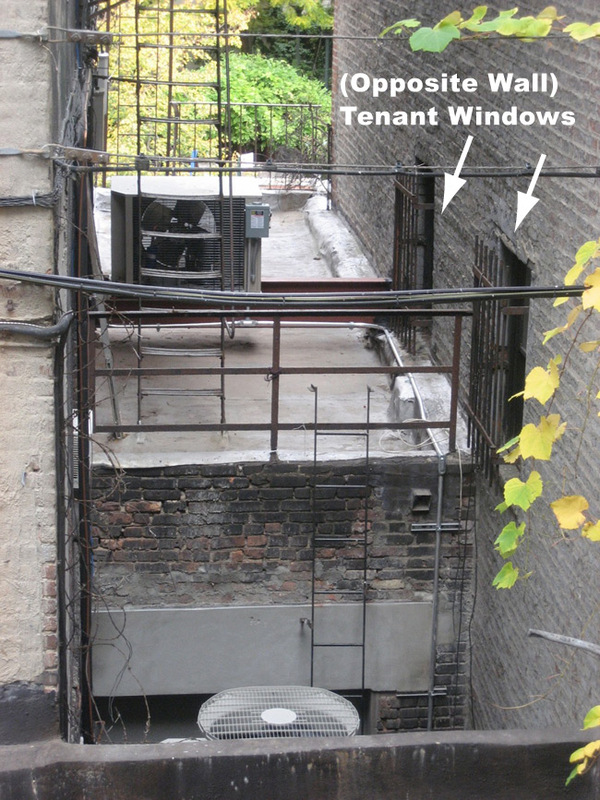 In one month, the tenants will request another noise reading; and once the violation is issued, Westminster will be taken to court where a judge may require that the refrigeration unit be removed immediately or the establishment (7-Eleven) closed. 7-Eleven has a sore arm from patting themselves on the back recently over their new Amazon lockers and KeyMe kiosks. Hey Margaret, 7-Eleven has created problems, lots of problems, for the very people you are desperate to win over. The “consumers” and their families want to sleep in their bedrooms. Solve that every day problem. Thank Heaven! A New DOB Violation for 7-Eleven! Thank Heaven! A 7-Eleven AC Unit Outside Your Bedroom Window! Categories: 7-Eleven on Avenue A | Tags: 7-Eleven 170 Avenue A, Margaret Chabris, Stop Work Orders, Westminster Management | Permalink. 7-Eleven and Westminster Management have racked up some major fines at their Avenue A location over 7-Eleven’s illegally placed AC and refrigeration units – over $17K to be exact! Multiple NYC DOB complaints were filed last fall, like this one for the industrial sized AC Units placed 14 inches away from the residents bedroom windows – they turn on and off every 15 minutes! 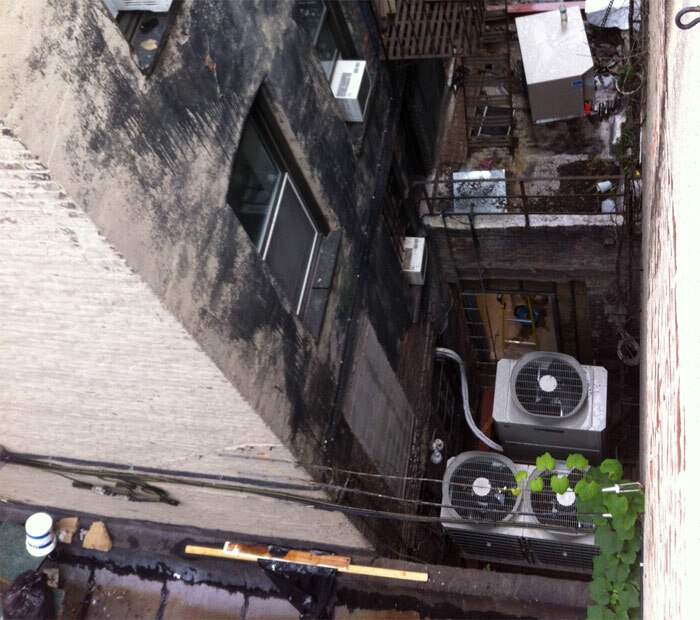 Another complaint was filed for a rooftop refrigeration unit which blocks access to a fire escape. A Partial Stop Work Order was issued but that didn’t top 7-Eleven from continuing work on their exteriors or removing their plywood shanty town shed to open. SEC. BC 1001.3. FAILURE TO MAINTAIN EGRESS CLEAR & UNOBSTRUCTED. NOTED: AT 1ST FLR SETBACK ROOF INSTALLATION OF AN AC UNIT HAS PARTIALLY OBSTRUCTED EGRESS 2 STEEL I-BEAMS ARE INSTALLED ACROSS THE ROOF APPROX. FAILURE TO PROVIDE UNOBSTRUCTED NOTED: CONSTRUCTION FENCE OBSTRUCTIONFIRE ESCAPE IN SEVERAL LOCATION. REMEDY: REMOVE OBSTRUCTION. FAILURE TO MAINTAIN ADEQUATE HOUSEKEEPING – NOTED- JOB FENCE OPEN ANDUNGUARDED LEAVING SITE ACCESSIBLE TO PUBLIC. REMEDY: MAKE SAFE IMMEDIATELY – MAINTAIN. But hey, who needs a good night’s sleep in a safe building when there are KEYS to be had?! Categories: 7-Eleven on Avenue A | Tags: NYC DOB, Stop Work Orders, Westminster Management | Permalink. Westminster Management is the property manager for 170 Avenue A, the location of the new 7-Eleven. 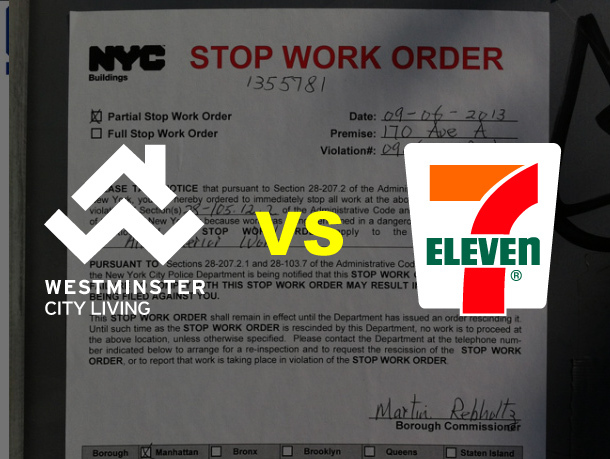 Workers onsite at 7-Eleven claim it is in fact Westminster who is responsible for racking up the Partial Stop Work Orders issued this month by the NYC DOB for 7-Eleven’s placement of 3 industrial AC units 14 inches from residents windows. The DEP is taking Westminster Management to court over the refrigeration unit on the roof which blocks access to a fire escape. Earlier this month, 7-Eleven brazenly disobeyed the Partial Stop Work Orders and marched on with their construction as caught on camera by a neighbor. 7-Eleven spokesperson, Margaret Chabris, has been suspiciously quiet on the Partial Stop Work Orders issue, probably due to her non-stop damage control relating to press confusion surrounding 7-Eleven’s mysterious new guinea pig store, all those health code violations in DC, the human trafficking scandal, distancing the company from employees weilding guns and a bloody clown robbery. Seriously, reading the news on 7-Eleven is like watching a COPS marathon on SPIKE TV. 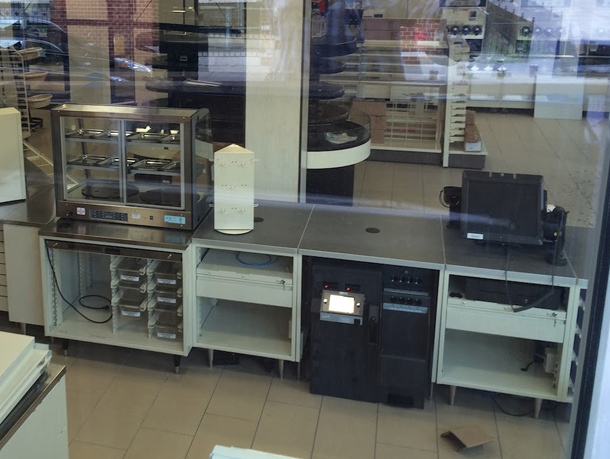 Anyway… EV Grieve has a post this morning with some interior shots of the 7-Eleven. The sad Slurpee shack sits lifeless at the cost of $30k per month. Yes, that’s what 7-Eleven is currently paying for the space. There isn’t a franchisee slotted for the store either. So, the question remains, who is responsible for correcting the host of issues preventing the 7-Eleven from opening, Westminster or 7-Eleven? Since neither side is talking we’ll just have to wait and see. One thing we know for sure, there is no way this 7-Eleven is opening by October 31st. Categories: 7-Eleven on Avenue A | Tags: 7-Eleven 170 Avenue A, Margaret Chabris, Westminster Management | Permalink. When DOES This Corporate Blight Open? No time soon! 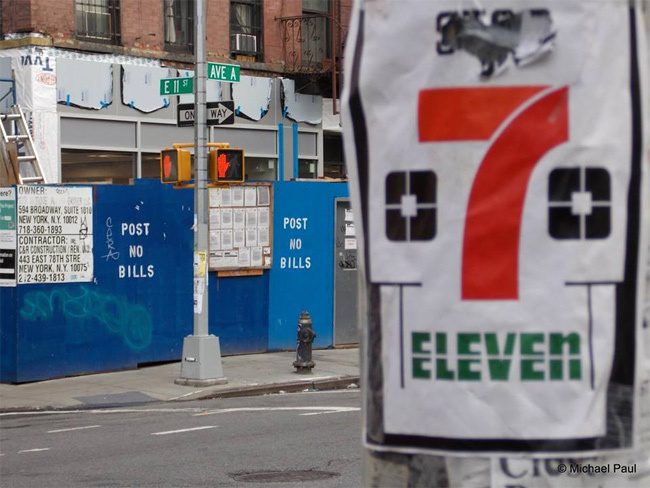 7-Eleven, the Texas-based based gas/beer/cigarette chain, was originally scheduled to open its East Village location in May only to have their opening date pushed to June, then to November and now October. However, there’s still the complicated matter of the various Partial Stop Work Orders in place. In order for construction to resume at 7-Eleven, a NYC DOB inspector said the 3 industrial size AC units will have to be moved at least 14 feet away from the apartment windows. Currently they are 14 INCHES away from the apartment windows. The Department of Environmental Protection is hauling the property manager of 170 Avenue A – Westminster Management – into court over the external refrigeration units. 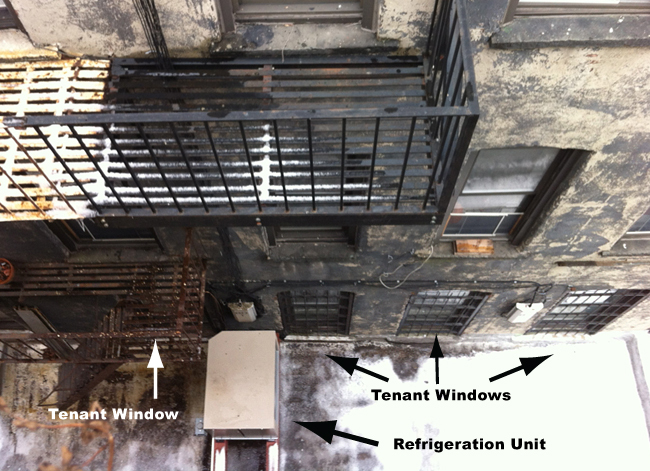 The refrigeration units also have to be moved because they block passage to a fire escape. The DEP has ordered the units to be turned off but 7-Eleven is above the law so they continue to run 24/7. The 7-Eleven continues to sit vacant and boarded up as it has most of the year, continuing to be little more than an eye-sore for the neighborhood and a lightening rod of controversy for the corporation. One has to wonder, with all the aggravation its presence has caused for the neighborhood, 7-Eleven and Westminster Management, is it really worth it? Categories: 7-Eleven on Avenue A | Tags: 7-Eleven 170 Avenue A, Stop Work Orders, Westminster Management | Permalink. 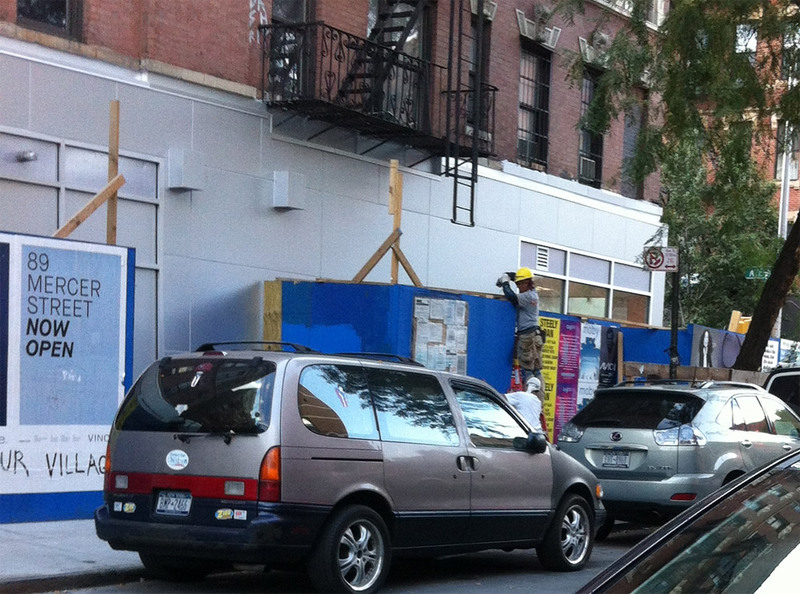 A tipster sends in this photo taken today of work being done to the exterior of the new 7-Eleven at 170 Avenue A despite several Stop Work Orders issued by the NYC DOB. Westminster Management is the building’s property manager. Categories: 7-Eleven Manhattan Locations | Tags: 7-Eleven 170 Avenue A, NYC DOB, Stop Work Orders, Westminster Management | Permalink. There’s never a dull moment when you’re an unwanted chain store forcing yourself on a neighborhood! 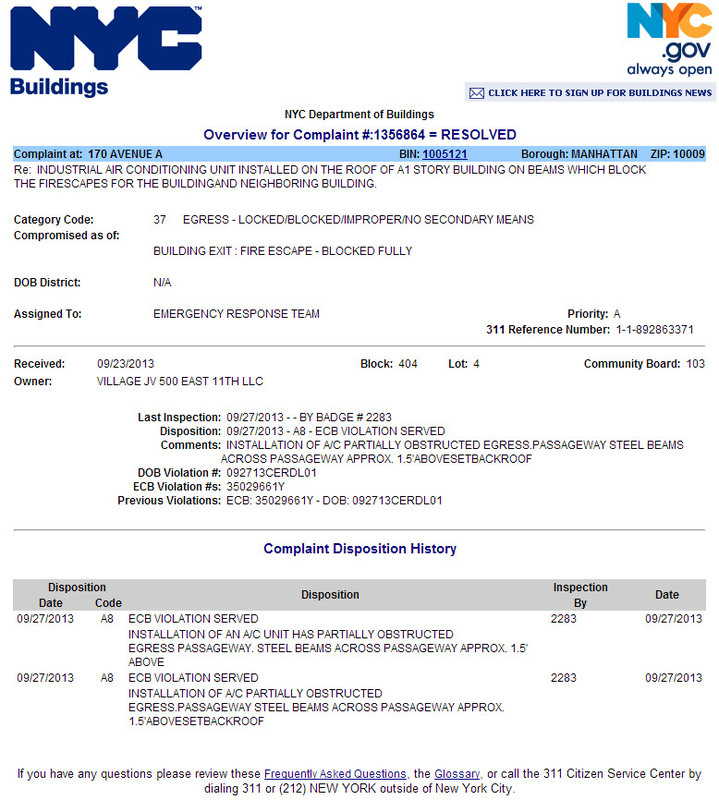 Today we learn the perpetually-under-construction 7-Eleven at 170 Avenue A has been slapped with a second DOB complaint, this time for blocking fire escapes. You may remember it was just a few weeks ago 7-Eleven was hit with their first Partial Stop Work Order by the DOB for installing the AC units a mere 14 inches from tenants windows. A source close to the construction say it’s in fact the property manager, Westminster Management, who may responsible for these violations.